Our visit to Athens was mostly spent in Fort Yargo State Park, a hilly, forested park with a glassy lake nestled among the hills of north Georgia, just about halfway between Atlanta and Athens. We found a picturesque campsite right on the edge of the lake, surrounded by tall skinny pine trees with a beautiful view. We spent our time there going for runs on nearby trails, grilling corn and juicy burgers over the fire pit at sunset, and reading in the hammock strung up a stone's throw from the lake……..but really most of the time our eyes were glued to our computer screens, fingers furiously tapping away, working on client websites, writing blog posts and overhauling our own website. We did manage to take a break from working to go explore Athens on Valentines Day afternoon. Athens is a small college town with roller coaster streets, pastel-colored houses, a dash of neo-hippie liberalism and a thriving music and bar scene. We heard about ADD Drug Store, an old-school lunch counter inside a pharmacy that's been around for 50 years, a hidden Athens institution that we couldn't pass up. We walked in past the cashier and spinning racks of sunglasses to find a seat on a low stool lining a long counter that enclosed a flat-top grill, milkshake machine, fryer, and prep station. The menu, spelled out in plastic letters on a back-lit Coca-Cola menu board, included classic items like "grilled pimento cheese sandwich" and "tuna melt" with no price higher than $3.65. We settled on a cheeseburger, a BLT, fries, a chocolate malted milkshake and two sweet teas and watched the waitress/cook as she deftly cooked up our lunch. Fifteen minutes later, she plopped our meal in front of us on paper plates. Everything was as delicious as you would expect a diner meal to be; greasy, satisfying and comforting. But the perfectly thick, creamy, malty milkshake was the crowning achievement; it was exactly the way a chocolate malted milkshake should taste. We thanked our waitress/cook, paid and left. With bellies stuffed full of diner food, we walked up and down the main drag of downtown Athens. There are historic brick buildings and a grand old theater, wide-windowed store fronts next to dark bars and quirky little shops and restaurants. We killed some time in Jackson Street Books, an independent bookstore crammed with mazes of bookshelves full of new and used books alike. After seeing pretty much all that downtown had to offer on a Thursday afternoon, we realized it must be a bit more exciting at night. 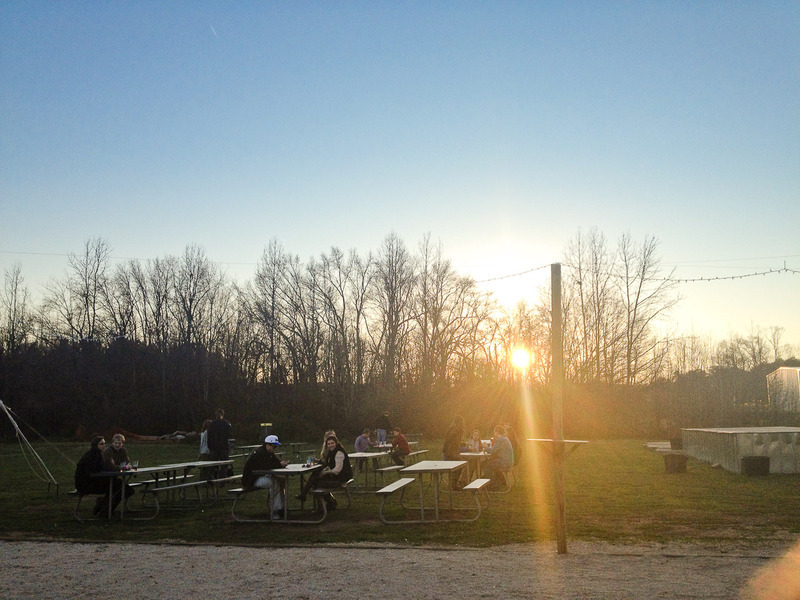 But instead of spending our evening doing Jaeger Bombs with college kids at a bar, we opted for Terrapin Brewery, a micro-brewery just a few miles from downtown Athens. They have brewery tours a few nights a week; for ten bucks, we each got a Terrapin pint glass, eight four-ounce pours of their beer on draft, a tour of the brewery, and could hang out in the backyard and listen to the musical stylings of guitar man Tre Powell. Unfortunately that night, they were bottling and packaging, so we couldn't get the full brewery tour, but we were able to talk to a friendly employee about their beer. They brew some pretty unusual beer; their Wake N' Bake is a stout brewed with coffee and oatmeal (really high gravity, but toasty and roasty like a bowl of oatmeal and a cuppa joe), a Chocolate Milk Stout that tastes incredibly similar to chocolate milk, but with an adult kick (SO GOOD), and the So Fresh and So Green, Green that uses fresh hops (instead of dry) that are overnighted from a farm in Washington and brewed within 24 hours of being picked (it's like a super fresh, smooth and floral rye). If you ever have the chance to try any Terrapin brew, do it, they're all delicious. Before getting too tipsy, we left the brewery to pick up some pho from a nearby Vietnamese restaurant and make the half-hour drive back to Fort Yargo. Despite Athens' heavy-handed collegiate influence that made us feel like old fogies, it's a beautiful city with more to offer than your standard small town in Georgia. Special thanks to Peggy P. (who suggested Madison is a beautiful town) for making this blog post possible!